Um, dois, très, quatro… the boxing code converted all four of their final bouts into gold medals on day six of the AUSC Region 5 Games here in this Portuguese-speaking nation on Wednesday. Both manager/coach Hannes Britz and coach Mlandeli Mnqibisa were beaming broadly as Siyakholwa Khuse, Ricardo Malajika, Mxolisi Zuma and finally Uyanda Nogogo picked up golds on the final day of pugilistic action. The gold medals came in the light-flyweight, bantamweight, lightweight and welterweight divisions against Namibian, Zambian, Namibia again and Angolan opponents respectively. Kuse was first in action against Erastus Jonas and despite being bothered by his headgear for most of the fight, the tiny little Mdantsane fighter took his time before forcing a standing count for his opponent a minute into the final round. There was a slight scare when a minute later his gum guard went flying but he had done enough. ‘It was tough but my straight left worked for me tonight,’ said the southpaw who is trained by Velile Domoyi back in the Eastern Cape. Then it was the turn of Malajika to step up to the plate and he prevailed after a scrappy fight against Everisto Mulenga. ‘I fight orthodox style but wow, that was the toughest southpaw I’ve ever fought. The third fight saw Zuma outclassing Tryagain Ndevelo in another impressive display. Exhausted and all but out on his feet after the victory, his performances over the Games saw him being named boxer of the Games, the cherry on the top for a fine fighting display b the SA contingent. The last gold went the way of Nogogo and it didn’t last longer than a round. Angolan opponent Kakutalua Funando seemed unsure of himself and didn’t offer much resistance. ‘I could see he wasn’t confident so I just went for a strategy of “tap-tap-right” and that did the trick for me,’ said the Mdantsane fighter, trained by Jack Khangelani. Earlier, the day had got off to a winning start at the Arena Pavilion Kilamba. South Africa had just three men’s tumbling gymnasts in action. In the team competition Gaofenngwe Tlatsana, Thato Dibe and Mtwe Motladile (aged 16, 15 and 15-years-old and all from Mafikeng, North West) combined to win gold, a joint score of 180.1 points beating Angola (173.5) and Zimbabwe (164.2). Only two competitors from each nation were allowed to go through to the final and that was Tlatsana and Dibe after their scores in the team competition. Tlatsana (pictured above) went on to take gold and Dibe bronze, with an Angolan opponent sandwiched between them. 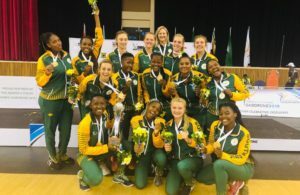 ‘I’m very happy with the the overall performance by the team,’ said coach Lebogang Ramokopelwa, himself a national grade tumbler who represented Team SA at the 2009 World Games in Taiwan. 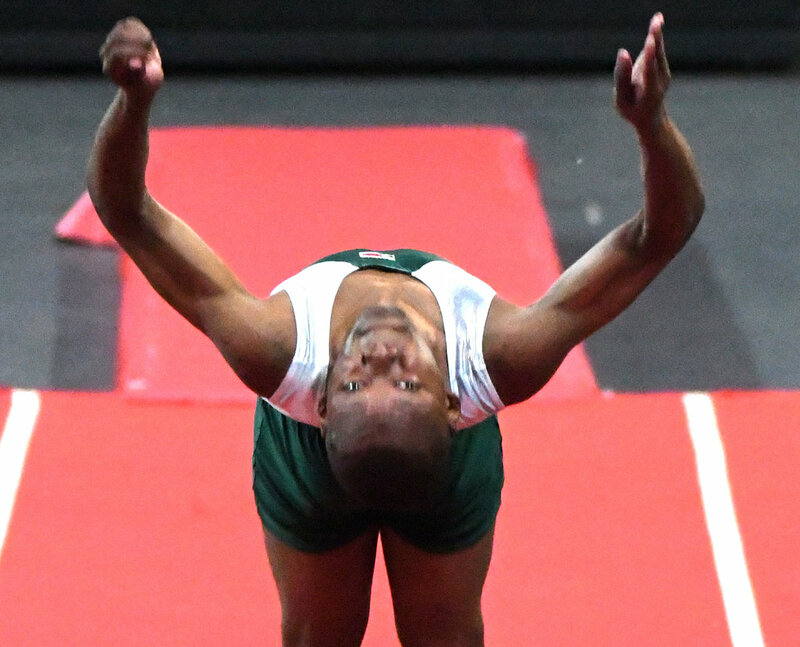 National champion Tlatsana is way more experienced, having ended 18th at last year’s World Tumbling Championships and he’s also African champion. Across the parking lot from the boxing, the SA netball team were facing their strongest opposition yet at these Games in the form of Botswana. Coach Jenny van Dyk’s girls led by just a couple of goals against extremely competitive opponents and after two quarters it was 20-11. The third quarter saw Botswana pulling back to 27-22 before the South Africans wrapped things up 36-28 at the final hooter. These two teams will now play each other in the final match of the Games. 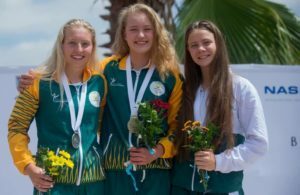 After six days of competition, judo, gymnastics, boxing and athletics are now done with, leaving only women’s football, netball, and swimming.